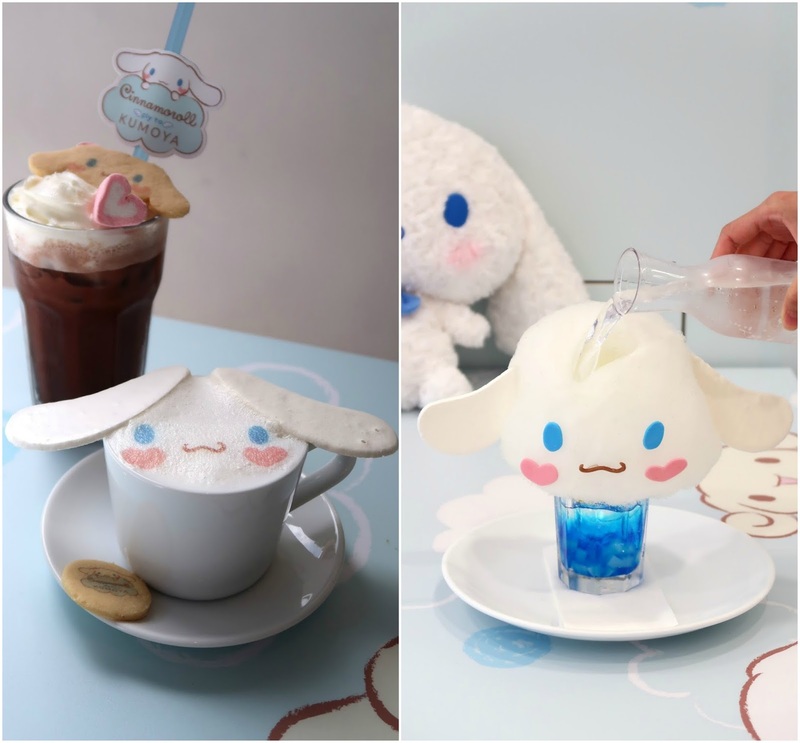 Cinnamoroll Pop-Up Themed Cafe, Sanrio x Kumoya Singapore | JACQSOWHAT: Food. Travel. Lifestyle. The food menu is specially designed and curated by the talented littlemissbento, our very own top bento artist, blogger and cookbook author in Singapore. You can expect all dishes to be presented in it's maximal aesthetic appeal, the extra details in every dish are specially made to look visually captivating. Kawaii is definitely the word. *Do note that there is a limit to your dining time of 90 minutes, and there is also a minimum spending of $10 per person. Adorable fluffy cinnamoroll Cafe Latte $8.90, using UCC Japanese coffee beans, and Kumoya's popular Iced Chocolate $8.90 in the background. On the right is the Cinnamoroll Blue Soda $14.90. Blue curacao syrup with nata de coco topped with cinnamoroll cotton candy. You gotta pour the soda water in to 'murder' the cute cinnamoroll first before drinking. I suggest doing a reverse video/boomerang on this. Each dinning table is filled cinnamoroll print, in fact every corner is adorably decorated. Moving on to main courses, there are 5 mains in total and the cafe serves up western dishes with Japanese influence or most call it Western-Japanese fusion. There is a choice for everyone on the menu, ranging from chicken to beef and salmon fish etc. Honestly, I wasn't expecting much in taste when it comes to such food but this has got to be my favorite among the 3 other dishes we tried. The Chicken Karaage with Waffles $19.90 do sound ordinary but the buttermilk waffles were dense and crispy, this exceeded my expectations. At the side were the deep fried karaage chicken topped with sweet shoyu glaze. This is the most expensive mains in the menu - Japanese Curry Rice $21.90. Cinnamoroll shape Japanese rice served with Japanese curry and tempura salmon. The price tag for this definitely goes the substantial human effort in creating this dish. Apart from the huge appeal factor, overall it tasted rather mediocre. The Flying Clouds Cinnamoroll Burger $17.90 is yet another appealing sight. Crispy chicken katsu sandwiched between fluffy Cinnamoroll mantou burger buns, alongside with potato chips with nacho cheese. The slab of breaded chicken thigh was juicy and fried to a nice golden brown. I wouldn't say it's fantastic but it makes a satisfying meal. There are a total of three plated desserts on the menu and two of them include Kumoya's signature parfait with yogurt swirl. The Cinnamoroll Berries Fantasy Parfait $17.90 include a soft souffle cheesecake, granola, mixed berries, panna cotta and macarons, then topped with a blue lagoon sauce, taste somehow like blue coral? On the other hand, I actually prefer the Espresso's Coffee Express Playground $16.90. A pancake parfait that comes with cookie crumble and a shot of cold espresso. For someone like me who loves coffee. The Cinnamoroll Yuzu Chiffon Cake $15.90 - A chiffon cake with a hint of yuzu flavour blanket with a layer of fresh cream. Apart from the appeal element this possessed, overall it did not meet the mark with it's dryness within. The overall interior is totally adorable with cinnamoroll plush toy at every table and no doubt cute things does make one happy. 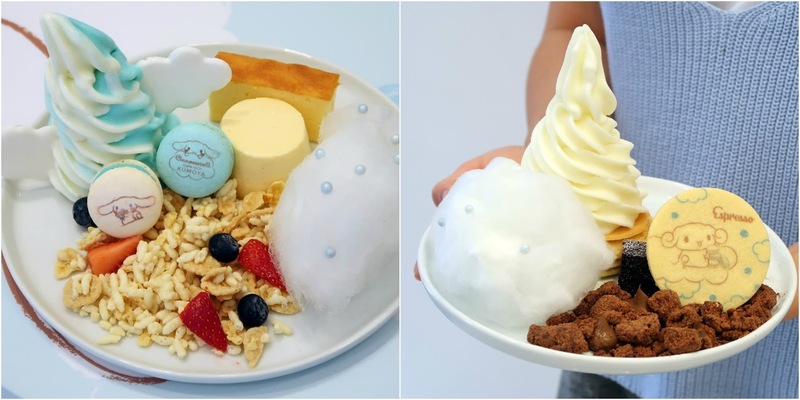 Kumoya is Singapore's first halal-certified Japanese-french inspired cafe and if you're a fan of cinnamoroll or any sanrio character in general, this is worth a visit for it's appeal element - yes that cuteness and fluffiness! In future i want to go a this cafe.